So back in the spring my sister had given me a few egg plants that were being thrown away by a plant vendor. They were not in the best shape but were not dead and only needed some love. I brought them home and planted them in a dirt filled crate. I didnt bother tilling a garden for them. If those plants only knew how bad of a plant momma I am. If you know me, you know I definitely do not have a green thumb. I have one house plant left over from a loved ones funeral years ago. It's the only plant I managed to keep alive and thats only because it tells me it needs watered by wilting. Ha. You know "Peace Lillies". Who can kill those? I also have a butterfly bush that grows beautiful every summer. Thats about the extent of my gardening expertise. Anyway, after a few weeks, the plants didn't seem to be growing well even though I made sure to check on them every morning and afternoon. I watered them regularly and made sure they had enough sun. A nest of fire ants decided to make a home at the foot of the crate so eventually I gave up caring for the plants. They were not growing well and the birds and squirrels were eating at them. I told my husband he could just use the dirt to fill a few holes in the yard. The egg plants have been ignored. This weekend, I figured I'd go out and see whats going on. The fire ants were gone amd the plants had really grown tall. All six of them seem to be healthy, strong and happy. Guess what else? There were three egg plants hanging on the stems. One looked like a wooden gourd as Its been there too long. The other two were beautiful. Small as they were, The were ready to pick. I was so excited. 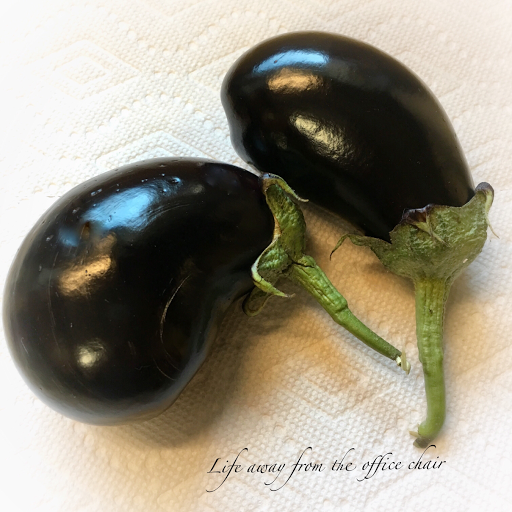 I cut the eggplants off and brought them inside. I cant believe I actually grew something. Ha. This was going to my lunch for Saturday. I washed and sliced them, afraid they would be bitter. To my surprise, they were perfect with a fresh taste. I decided to bake them instead of frying them. 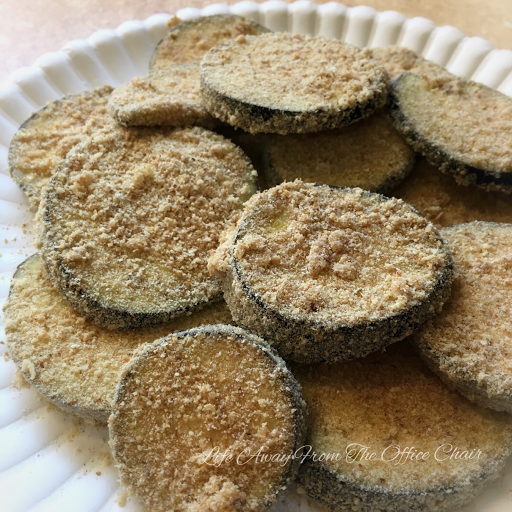 I dipped them into an egg and milk mixture and rolled them in bread crumbs. The slices were then placed on a pan coated with olive oil. Baked for 15 minutes, then I sprayed the tops with more olive oil, flipped and baked another 15 minutes. Oh my goodness, these things were delicious and I felt proud that I grew them myself. I topped them with my Nutrisystem meatballs and sauce. Made a wonderful meal. My husband is not a fan of eggplant but he even liked them. There are a couple more egg plants producing, but they are not ready to pick yet. Maybe by next week, they will be ready for another meal. I will not bother them, for they did better when ignored. Ha. Eggplant is one of the very few foods I refuse to eat!! I'm actually cooking some eggplants out of my garden today for supper. I fry them dipped in egg and bread crumbs. Then layer them in a baking dish like you would lasagna, with sauce, mozzarella cheese, and Parmesan. Then bake them in the oven till all is heated through. I am a gardener and have often failed in growing eggplants. Perhaps I need to neglect them. Thank you! They were delicious. let me guess. They were the best eggplants you ever ate. Yum. We have an eggplant on our deck. We've nursed it through the hot weather. When I looked a little while ago there were two more egg plants almost ready to pick. The eggplants you prepared look amazing. Thanks! Hope yours are equally delicious. Funny that. 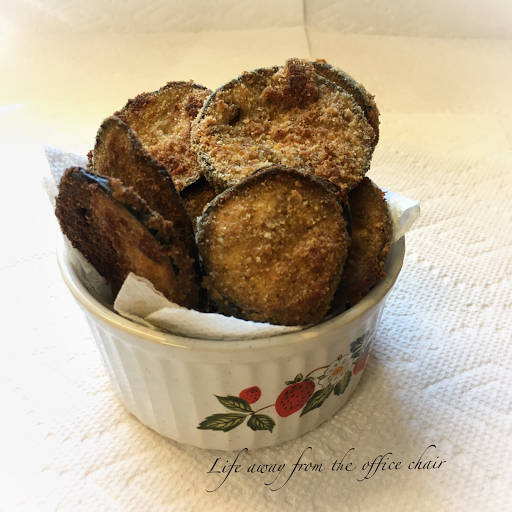 I do love egg plant, but I must have been 50 years old before I tasted one. I have never grown one. I would bet I was in my 30's before I saw one growing. They are PRETTY growing. It was definitely a surprise to see them hanging there.